Holes through which the water flows in to fill the lock-chamber or out to empty it. Watertight door or pair of doors made of wood or metal that open when the water levels between the lock-chamber and the upper level are the same. Holes through which the water flows to fill the lock-chamber. Conduit with a sluice that opens to raise the water level in the lock-chamber. Ladder fixed to the side wall for climbing up out of and down into the lock-chamber. Indentation in the side wall into which a gate fits when open. 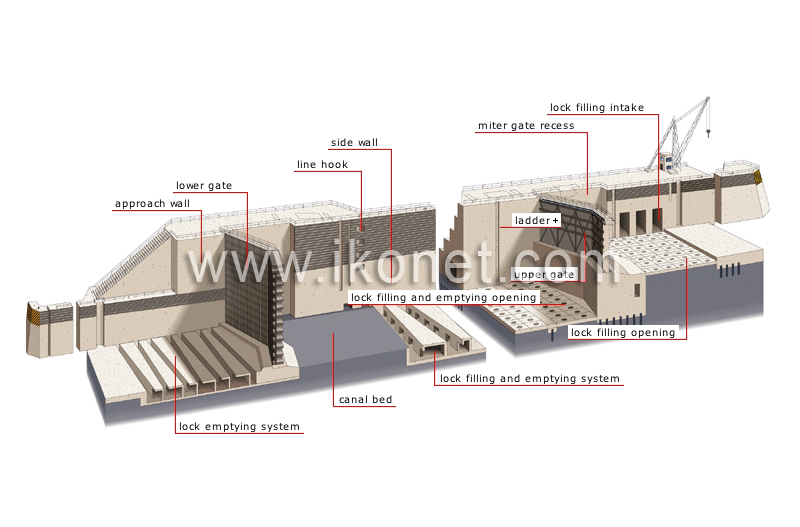 System consisting of a conduit with sluices alongside the side wall and perpendicular conduits on the canal bed that together raise and lower the water level in the lock. Thick concrete base that makes up the lock’s foundation. Conduit that evacuates the water from the downstream side causing the water level in the lock-chamber to go down. Wall along the side wall that guides ships into the lock. Watertight door or pair of doors made of wood or metal that open when the water levels between the lock-chamber and the lower level are the same. Piece of wood or metal attached to the side wall for securing the rope that holds a ship in place while it is in the lock-chamber. Wall forming one side of the lock-chamber and supporting its doors.